The Roanoke Valley is the medical center of western Virginia, serving over a million people. The area offers state-of-the-art cardiac and cancer diagnosis and care, as well as a Level I Trauma Center and more. Included in the health care system of the Roanoke Valley are three major hospitals, a Veterans Administration medical facility and numerous satellite and treatment centers, collectively employing over 15,000 people. In 2015, the cost of health care in Roanoke ranked below the national average, with charges only 94.5% of the national scale of 100%, a further example of the combination of high quality of life and low cost of living in Roanoke. Rounding out the health care offerings in the Roanoke Valley are the many opportunities for medical education through Associate, Bachelor, Masters, and Doctorial degree programs and extended studies at colleges, universities, and training facilities. 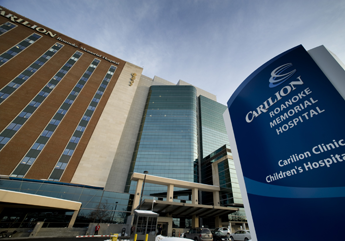 Carilion Clinic is a healthcare organization with more than 600 physicians in a multi-specialty group practice and eight not-for-profit hospitals. Carilion Clinic specializes in patient-centered care, medical education and clinical research, with a goal of providing the best possible health outcome and healthcare experience for each patient. In 2007, Carilion Clinic partnered with Virginia Tech to create the Virginia Tech Carilion School of Medicine and Research Institute (commonly known as VTC). VTC is housed in a 150,000-square-foot facility at the Riverside Center on Carilion Clinic's campus in Roanoke, Va. The first class of doctoral candidates began course work in August 2010. As a 521-bed tertiary facility, LewisGale Medical Center has provided state-of-the art medical care for residents of the Roanoke Valley and Southwest Virginia for more than 100 years. The medical center maintains a national reputation for its Cardiac, Cancer, Maternity Care, and Behavioral and Rehabilitation services. Since 1934, the Salem Veterans Affairs Medical Center (VAMC) has provided high-quality primary and secondary diagnostic and therapeutic health care to more than 112,500 veterans living in a 26-county area of southwestern Virginia. The medical center offers 178 acute care and 90 extended care rehab beds. The Salem VAMC is a primary teaching hospital for two medical schools; the University of Virginia School of Medicine, and the Edward Via Virginia College of Osteopathic Medicine. Medical residents from the University of Virginia and Carilion Clinic train in surgery, internal medicine, psychiatry, family practice, and ophthalmology. Salem VAMC has interns or residents in pharmacy, podiatry, and psychology as well, and train nurses from Virginia Western Community College, Radford University, the University of Virginia, and ECPI. Training is provided for over 500 students and residents from over 60 health career programs across the country. Catawba Hospital specializes in serving adults who need mental health care. The hospital offers both short-term "acute care" units and dedicated geriatric units. Catawba Hospital is affiliated with the University of Virginia School of Medicine, where staff psychiatrists may have faculty appointments and help train psychiatry residents and medical students. A clinical practicum is available for students of various disciplines to include nursing, psychology, social work, music therapy, recreation therapy, and food and nutritional services.